This is probably the most mysterious single I've ever bought. It didn't come with a sleeve, so all I have is the disc and the info on the label. It is credited to Groot Draaiorgel Mortier, and since the single is made in Belgium I have to assume it's a Belgian barrel organ. The songs played by this barrel organ all come from the 1960 edition of the Eurovision Song Contest: 'Niet voor mij', 'Wat een geluk', 'Looking high' and 'Tom Pillibi'. 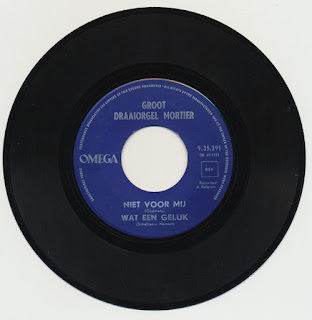 There is no information about Groot Draaiorgel Mortier on the web, so this single looks likely to remain a mystery.